Modiphius Entertainment has announced they are working to bring their tabletop gaming universe Achtung! Cthulhu to the big screen. The company has signed script writer Dirk Vandereyken and director Raine McCormack to work on the film adaptation. Modiphius Entertainment was launched in 2013 with the Kickstarter hit for Achtung! Cthulhu, a tabletop roleplaying game, raising over £200,000 in funding, and unlocking 11 books and over 2000 pages of storyline inspired by H.P. Lovecraft’s Cthulhu Mythos. A subsequent Kickstarter by Paris-based Devil Pig Games this Summer raised £150,000 for a licensed boardgame based on Achtung! Cthulhu which showed the brand has huge potential and Modiphius has also raised £150,000 for the reboot of the massive 90’s gaming brand Mutant Chronicles. Modiphius recently announced a co-operative boardgame based on the Thunderbirds license with designer Matt Leacock at the helm. The team is already in talks with film investors and have begun preliminary casting. Achtung! 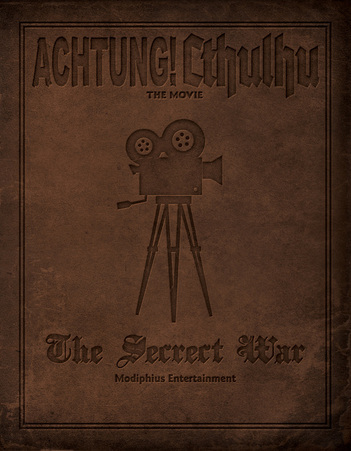 Cthulhu – The Secret War will be following the usual process for feature film funding, with shooting slated for Summer 2015. Modiphius is considering a Kickstarter in the Spring of 2015 to top up the budget as well as funding a series of roleplaying supplements and other games tied in to the storyline of the movies. Achtung! Cthulhu is envisaged as a series of films following the exploits of various characters through the Secret War and will be accompanied by a special web series for fans.